Today as we prepare for the great feast of Divine Mercy Sunday, we continue with the sixth day of the novena of chaplets, prayed with ordinary rosary beads. 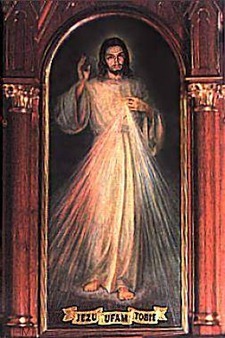 For complete instructions on how to pray the Divine Mercy Chaplet, visit the Divine Mercy website of the Marians of the Immaculate Conception at: http://thedivinemercy.org/message/devotions/praythechaplet.php. For the complete text of the sixth day of the novena, please visit the Divine Mercy Website of the Marians of the Immaculate Conception at: http://thedivinemercy.org/message/devotions/novena/sixthday.php. 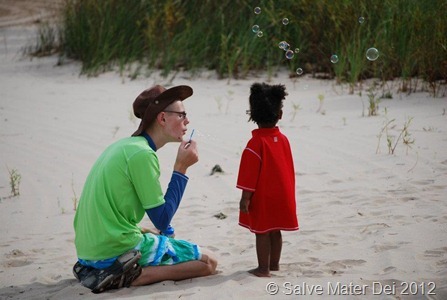 I Would See Miracles Every Day © SalveMaterDei.com, 2012. If I had the faith of a child, my prayers would be simple. 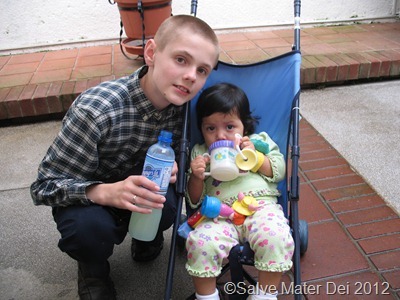 He Would Delight in My Littleness © SalveMaterDei.com, 2012. 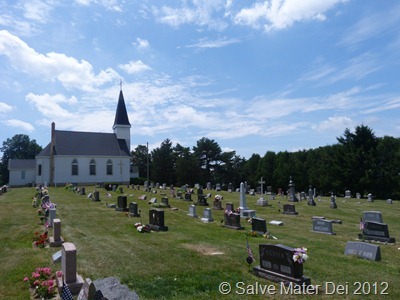 I Would Hope for Heaven © SalveMaterDei.com, 2012. Christ Himself repeats the query of the angels: “Woman, why are you weeping?” She perceives Him to be a gardener, and is so intent on finding the dead Jesus, that she misses the Risen, Living Christ in front of her very eyes! 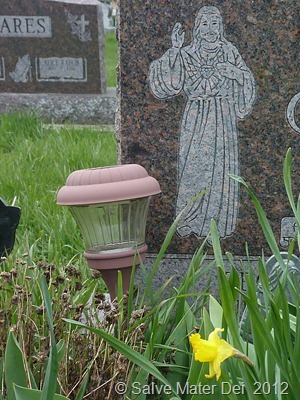 She wants to find Jesus’s body, and return it lovingly to the tomb. She is even willing to try to carry it herself – “tell me where you laid Him, and I will take Him.” However, God’s plans are far greater than she can imagine. 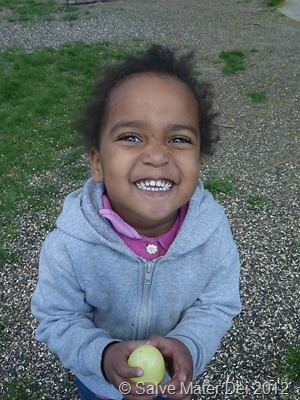 As Jesus calls her name, her eyes are opened – just like so many of the blind whom Jesus had cured. 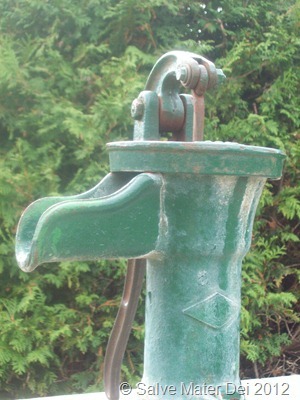 One can imagine the joyous reunion and Mary hugging Jesus with the strength of an iron vice-grip. One can almost sense a hint of amusement in Our Lord’s voice as He tells to loosen her grip: “Stop clinging to me!” Jesus tells Mary that He still has work to accomplish. “I have not yet ascended to My Father and your Father, My God and your God.” It is as if Our Lord is telling her, “In Heaven you will have all eternity to cling to Me if you wish, but for now, We need to get moving. You have work to do, as do I. For the complete text of day 5 of the novena please go to the Divine Mercy Novena Website of the Marians of the Immaculate Conception at http://thedivinemercy.org/message/devotions/novena/fifthday.php. On the other hand, we have the guards, strong Roman men, battled hardened soldiers, who fell down “as dead men” at the sight of the Resurrection, and quiver in fear as they approach the chief priests and the elders. One wonders which frightened them more – the vision of Christ busting forth from the tomb or the wrath of Pilate and the Council. Either way, they were terrified. We sense the darkness of their hearts, the darkness of the situation. They were offered bribes to hide the most significant Truth ever witnessed by human eyes, and they capitulate. Likewise, the religious elders and chief priests seem equally shrouded in darkness and fear. 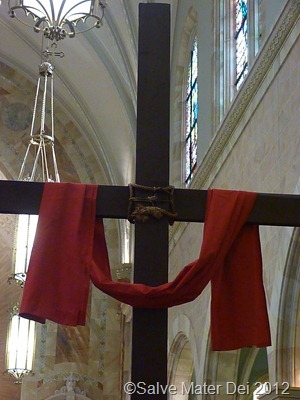 They know the truth – they crucified the Messiah, and now He is Risen. If He is strong enough to conquer death, do they really think their secret will last forever? They don’t care. They would rather perpetuate a lie, than embrace the reality of the Resurrection. 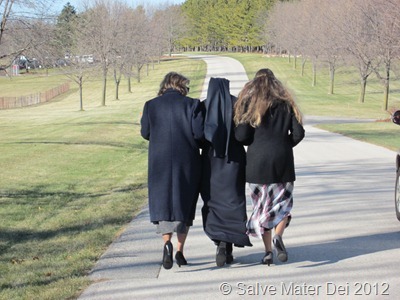 Like Sr. Faustina, let us beg the Heavenly Father to “draw them to the light of the Gospel,” that they too may extol the mercy of God for endless ages. 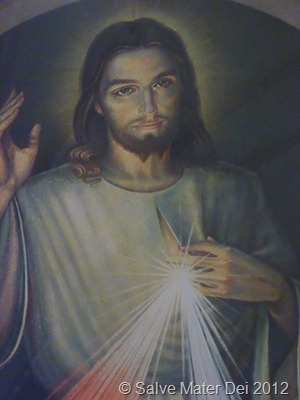 For the complete text of the fourth day of the novena, please visit the Divine Mercy Website of the Marians of the Immaculate Conception at: http://thedivinemercy.org/message/devotions/novena/fourthday.php. The Lord has indeed risen, alleluia! Glory and Kingship be His forever and ever! There is no greater joy, no higher feast, than the celebration of the Resurrection of Our Lord Jesus Christ! 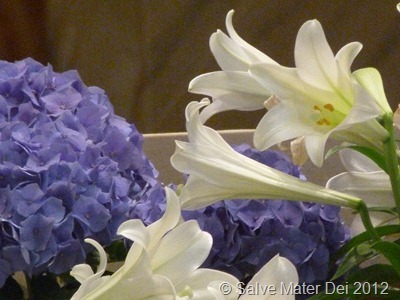 May Christ bestow on you and yours all the blessings of this Glorious Easter Morning! Christ has Risen! Death has been conquered! Salvation has been won! The Lord is victorious! her Divine Son, kissing the bruises and bloody gashes. The disciples had seen his body prepared for burial; they helped wash Its cold and lifeless limbs, anointed It with spiced oil, aloe, and perfume, and hastily wrapped It in a clean linen shroud. These friends helped to roll the heavy stone at the door of the tomb, and watched as a guard sealed the tomb, and menacingly guarded its entrance. 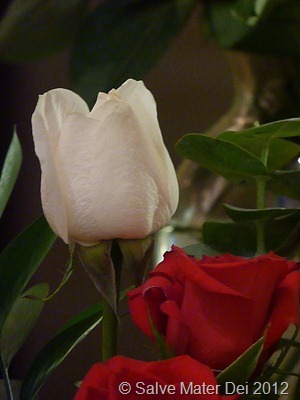 Yet all of that belonged to yesterday- the darkness and death are gone, in it’s place Resurrected Life is to be found. 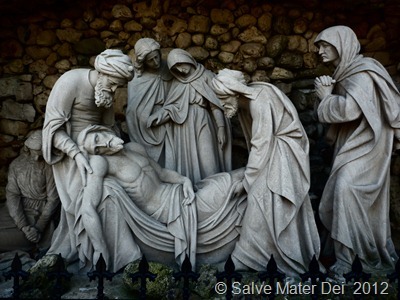 One can sense the panic as Mary Magdalene approaches the tomb, with Mary the mother of James and Salome, to find the stone rolled back. The thoughts and questions must have fired like lightning in a storm. The guard is missing, the burial cloths are there, but empty. Where is He? Where has He gone? Where have they laid Him? I imagine their encounter with the angel – the joy and confusion. How can this be? Yet, nothing is impossible with God! I envision myself running like Peter (o.k., Peter probably ran faster than would I), out of breath, quivering, questioning, grasping for truth. I contemplate John, peering into the tomb, waiting in silent wonder for Peter to enter first, and together to encounter a reality beyond their human powers of comprehension. We are offered the same reality, and yes, we must stretch our powers of comprehension and assent to faith to believe what we cannot see. 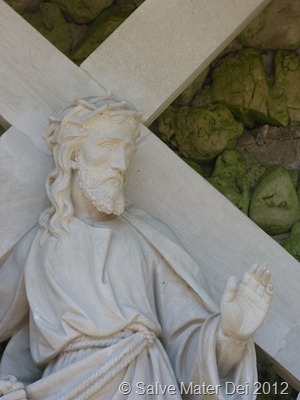 To participate in the Resurrection, and share its joy we must embrace what we cannot as humans explain nor understand. Faith involves a choice, and we must will it! Do not be amazed, do not seek Him among the dead, for He is not there. He is risen! He is truly Risen, indeed Alleluia! Go and tell others! Share the joy of this moment, that all might come to believe. 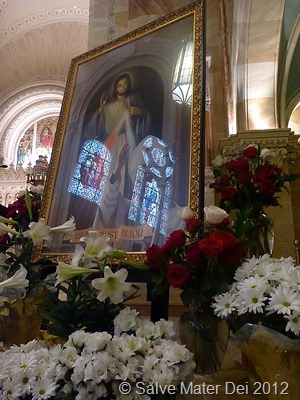 As we continue our journey in the octave of Easter, moving toward the Feast of Divine Mercy, let us continue to prepare our hearts to receive all the grace and blessing that our Risen Lord wishes to bestow upon us. Let us continue to contemplate the wondrous Mercy that is His ultimate gift to humankind. As we daily pray our novena of Divine Mercy Chaplets, let us consider this Passion of Christ that is the mystery of our redemption. The chaplet is prayed on ordinary rosary beads, and takes only about 3 minutes to recite. 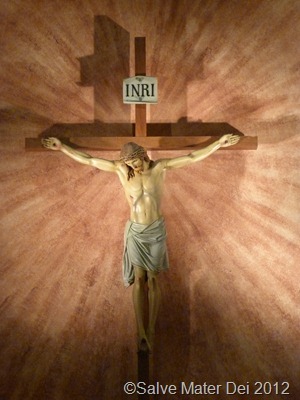 The full text for the Chaplet can be found on the Marians of the Immaculate Conception Website at: http://thedivinemercy.org/message/devotions/praythechaplet.php. Like St. Faustina, let us today pray for all the faithful, that they may never fail in love or lose the treasure of the Holy Faith. Let us beg the Heavenly Father to surround these souls with His constant protection so that they may one day glorify the immeasurable mercy of God with the angels and saints in Paradise for all eternity. 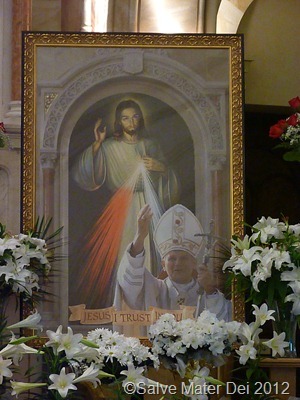 The entire text of the third day of St. Maria Faustina’s Divine Mercy Novena (as directed by Our Lord Jesus) can be found on the Marians of the Immaculate Conception Website at: http://thedivinemercy.org/message/devotions/novena/thirdday.php. Wishing you and yours the joy of a glorious Easter. Rejoice Heavenly Powers, Sing Choirs of Angels! What a beautiful day! I love Holy Saturday. 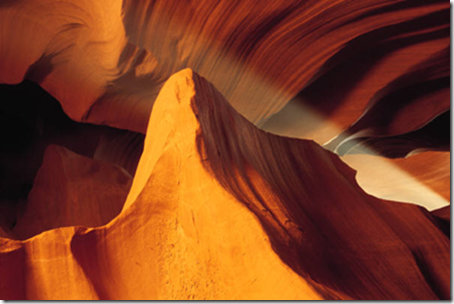 There is a rhythm of expectation that builds as a crescendo throughout the day. 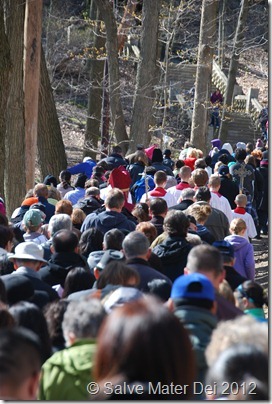 Good Friday was a busy one. 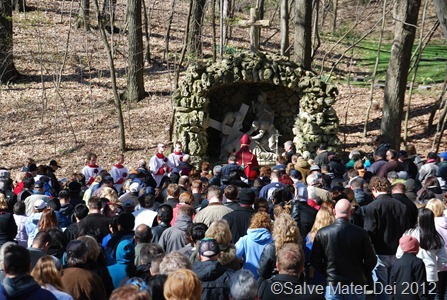 We began with the outdoor Stations of the Cross, led by Archbishop Jerome Listecki, at the Basilica of the National Shrine of Mary Help of Christians at Holy Hill. It was a gorgeous day. While last year we were pelted by freezing rain (I watched the ice-balls form on the servers’ candles); this year the sleet was replaced with beams of sunshine. My boys served and the girls sang as we processed up Holy Hill, winding our way through the Stations of the Cross with hundreds of others, faithfully retracing Christ’s journey to Calvary. 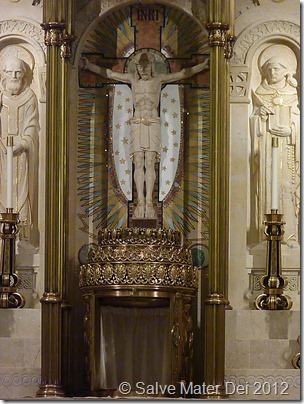 Later, we returned to the Basilica for the Memorial of Our Lord’s Passion. As usual the church strained with an overflowing capacity, as Christ’s Passion was remembered in both Spanish and English. The devotion of the faithful (friars, pilgrims, and religious alike) was palpable for hours within these sacred walls. 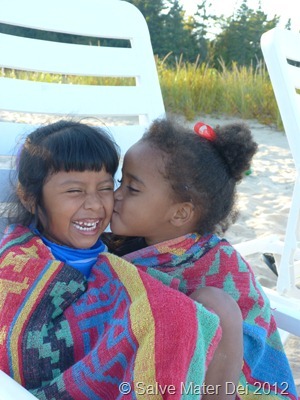 The mundane chores of feeding, cleaning, and caring for my brood continued as the day wore on. After the family Rosary, and Night Prayer from the Divine Office, most of the family was blessed and tucked in bed. My husband, our eldest two children and I then sat up until 12:30 A.M., watching The Passion of The Christ, as is our tradition. 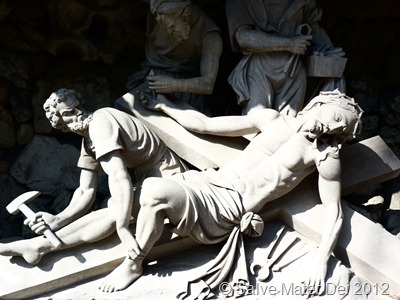 The heart-wrenching scenes of the scourging, and carrying of the cross are freshly re-etched in my mind. I can barely look at the vivid pounding of the nails into Jesus hands as His arms are yanked from their joints. I cannot imagine watching these scenes nonchalantly; for each year, they seem to resonate more deeply within my very core. 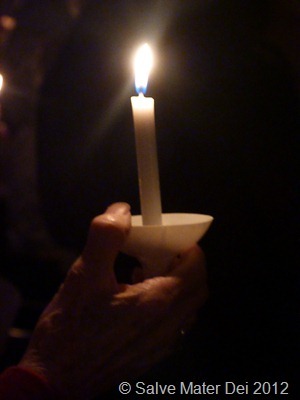 Today, the sorrow of Good Friday seems to slowly be melting into the joy that is about to be Easter. The boys share the honor of serving for tonight’s Easter Vigil, and spent a couple hours at the Basilica practicing this morning. 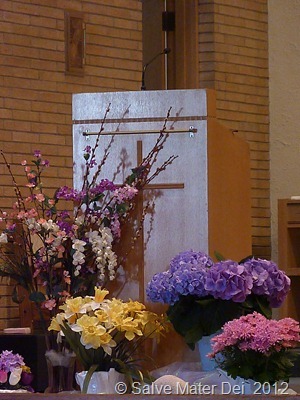 I hear the altar flowers are magnificent, and that their abundance fills the church. 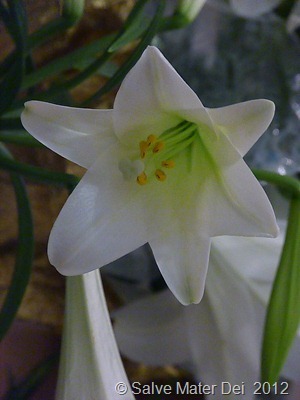 I can hardly wait to experience the sight and fragrance tonight. 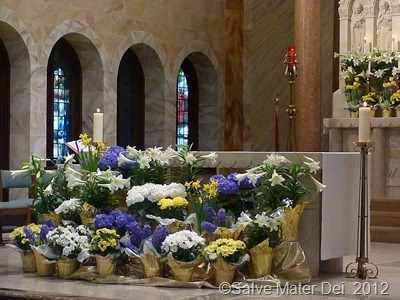 We brought baskets containing our Easter Vigil meal, and a bit of candy to the monastery office to be blessed by Fr. Dan. The daily chores continue, but with an eager anticipation of the glory of the Resurrection that we are about commemorate tonight. We thus continue our preparation for the Feast of Divine Mercy, a Feast instituted by Our Lord, on which He tells us that “the very depths of His mercy are open.” In preparation, we continue our novena of chaplets. Remember, the Divine Mercy Chaplet is prayed on ordinary rosary beads. 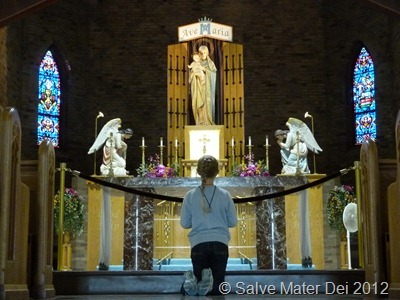 This link to the Marians of the Immaculate Conception Website gives clear directions for praying the Chaplet of Mercy: http://thedivinemercy.org/message/devotions/praythechaplet.php. 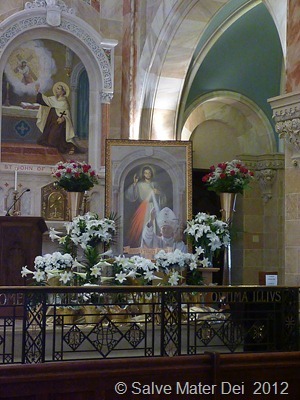 Today we also, continue the novena dictated by our Lord to St. Maria Faustina. 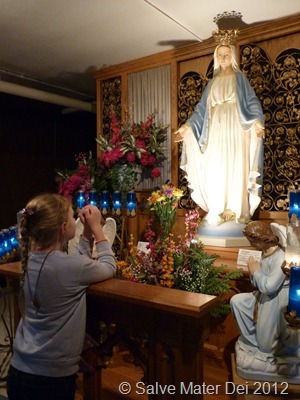 This novena, initiated for her private devotion, offers spiritual fruit for all who pray it faithfully. On each of the nine consecutive days prior to the Feast of Divine Mercy, Jesus requested that St. Faustina immerse a certain group of souls in the ocean of His Mercy. Our Lord would in turn bring those souls into the House of Our Heavenly Father. On the second day of the novena, Sr. Faustina was instructed to pray especially for the souls of the priests and religious. 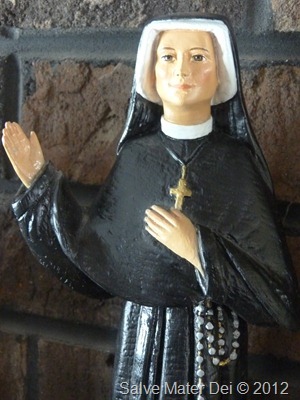 As I do not want to break copyright laws or plagiarize, for the entire text of St. Faustina’s novena Day 2, please visit the Marians of the Immaculate Conception site at: http://thedivinemercy.org/message/devotions/novena/secondday.php. 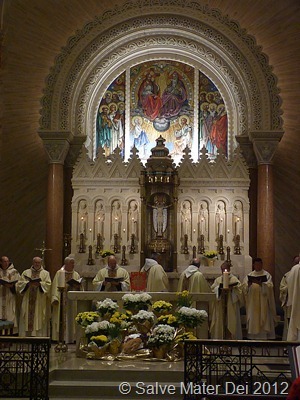 Without priests there would be no Mass. There would be no one to Baptize, washing away the stain of original sin, and bringing the Light of the Holy Spirit to our souls, and those of our children. Without priests there would be no Eucharist to nourish our souls, nor sacrament of penance to reconcile us to God when we had rejected His love. Without priests, we would have no hope of becoming soldiers for Christ, or having our marriages become truly sacramental unions. Without priests, our souls would never have the sacramental grace given as we prepare to leave this life and enter into the next. 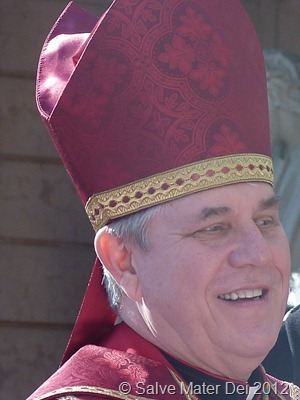 Our priests are a treasure, one this secular world often despises and rejects. So too let us remember the religious sisters and brothers who support the church and the society with prayer, sacrifice, and works of charity. These hidden souls labor perpetually for the salvation of the world, and receive little positive attention for their monumental efforts. Just as the secular world distains the priests so too it seems to revel in ridiculing the very existence of religious sisters and brothers. In appreciation for the tremendous gift of priests and religious, let us follow Christ’s request, and immerse them in the abyss of His mercy, and present them to the Heavenly Father for His blessing. Today we recall the most pivotal event in the history of human kind: the day on which Our Lord suffered, was crucified, and died to pay the penalty of our sin. 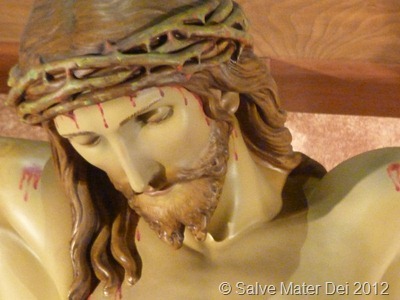 On this day we pause and recall our own sins, and the burden our actions have added to Our Lord’s sacred shoulders. 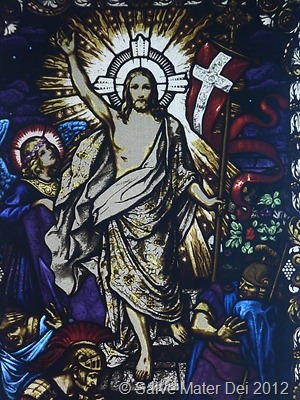 While this is a solemn, somber celebration of our Lord’s passion and death, there is also a glimmer of joy; for in His passion and death is the ultimate expression of merciful love. It is no coincidence that today we also begin to prepare for the Feast of Divine Mercy. That preparation begins with the novena of Mercy. For the text of the entire first day of the novena, please visit go to the Marians of the Immaculate Conception Website at http://thedivinemercy.org/message/devotions/novena/firstday.php. Tonight we embark upon the Holiest days of the Church Year: the Triduum, the Memorial of the Passion of our Lord Jesus Christ. The solemn celebration of the Triduum begins tonight with the celebration of the Mass of the Lord’s Supper- the Mass of His Body and Blood. On this, and every Holy Thursday, we celebrate the greatest miracle and mystery in human history: that our Lord Jesus loves us so much that He feeds us with His own flesh and blood. On this night He instituted the Sacrament of the Holy Eucharist to be a perpetual source of grace. Tonight we celebrate not only the institution of the Holy Eucharist, but also the institution of a royal priesthood. 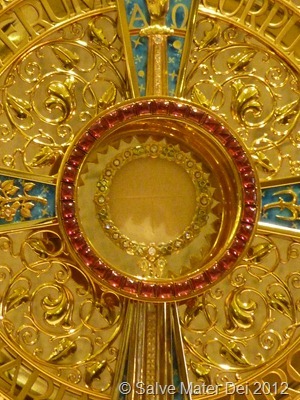 For without the gift of the priesthood, we would not have the treasure of the Eucharist. Likewise, without the Eucharist, we would not have the priesthood. It is the priest who consecrates bread and wine, which at his word become the real Body, Blood, Soul, and Divinity of Our Lord Jesus Christ. The priest is the vital instrument by which Our Lord chooses to bring Himself to us- renewing in us His covenant of love. This is truly a night of miracles. 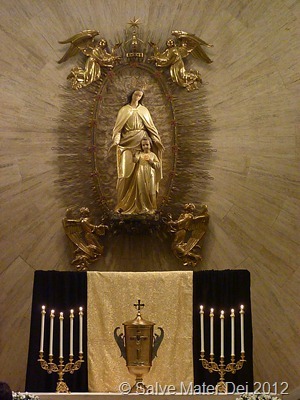 Yes, tonight’s Mass is replete with symbolism and the beauty of ancient ritual. 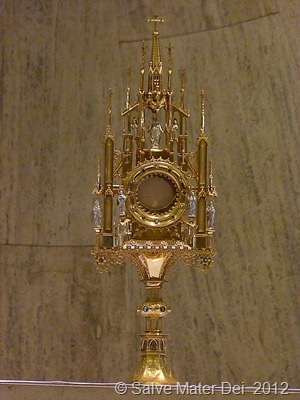 But beyond the symbolism there is tangible reality, and the greatest reality of all is the Holy Eucharist. Symbolically, tonight twelve men are chosen to represent the Apostles. 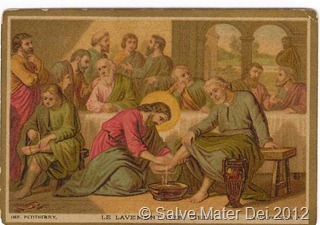 Just as on this night centuries ago, Christ washed the feet of the His apostles, so too we are symbolically reminded of our call to wash the feet of others. Our Lord assumed the posture of slave, to perform the most menial task out of love. As we watch the re-enactment of the washing of the feet, and sing the antiphons, we too are reminded of our call to serve others as a reflection of Christ’s love alive within us. We are not merely bystanders, we are participants, as we carry the love of Christ to the world as servants of the Divine Master. This example I leave you. You can have no part with me. then surely you must wash one another’s feet. 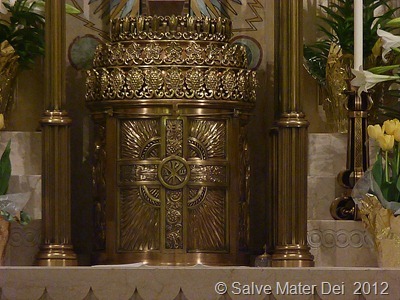 Tonight, after Mass, the Holy Eucharist is transferred to a Tabernacle of Reposition, to be adored throughout the night. 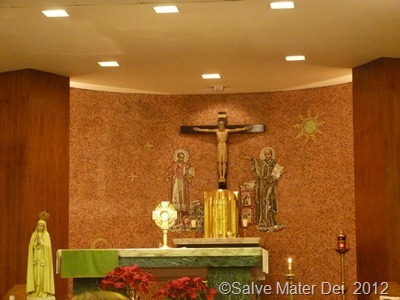 The Pange Linga (Sing my tongue the Savior’s Glory…) is sung as the Blessed Sacrament is processed around the Church. As the procession nears the Tabernacle of Reposition, the chorus changes to Tantum Ergo Sacramentum. 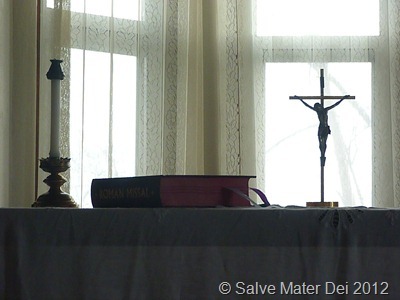 These beautiful ancient hymns were penned by St. Thomas Aquinas, and express in chant the profound nature of the mystery of the Holy Eucharist and the reality of the Blessed Trinity. Tonight, a plenary Indulgence is granted, under the usual conditions (Holy Communion, Sacramental Confession within eight days, prayer for the intentions of the Holy Father, and freedom of attachment to sin), for those who devotedly recite the Tantum Ergo on Holy Thursday after the Mass of the Body and Blood of Christ, during the liturgical rites (Handbook of Indulgences, 1991 Catholic Book Publishing, p.84). 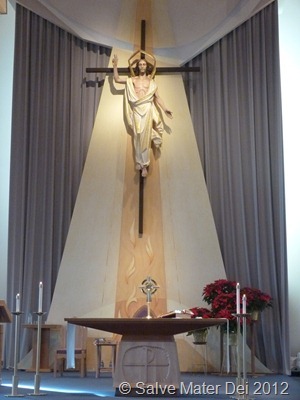 The altar is stripped. The crosses are covered, and all depart in silence to contemplate the greatest gift ever given.